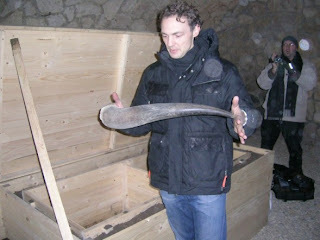 Christian’s white whale forges onward to our afternoon stop at Michlits/Meinklang winery. The winery is actually named Michlits, or is it Meinklang? I don’t know why, but in the US the name has to be altered to Michlits for distribution. 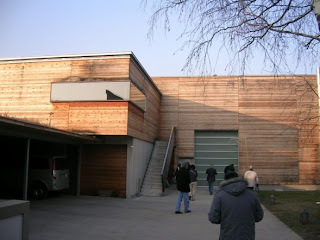 The winery is ultra modern looking, but uses all natural materials. As we approach the flat, winter brown fields I have no warning that my life is about to be changed forever. waves topple boats. Between rows of perfectly manicured vines on both sides, the Graupert vineyard stands out like a punk rock spiked mohawk on the set to Leave it Beaver. In a deep spiritual moment with his vines, Werner Jr. thought that if he lets the vines go wild, eventually they will become self-limiting and reduce the stress of pruning each year which was hurting the vines. Essentially, if left to grow wild the grapes will be better. And you know what? It’s working. The vines unkempt look are criticized by his neighbors and he is accused of being lazy. In fact, last year some locals set fire to part of the Graupert vineyard to make their point. The proof is in the bottle and the Meinklangs remain committed. And, there is talk of letting all their vines grow Graupert style. Oy, the potential bonfire! You will see some Graupert Pinot Gris coming to Wine Authorities this spring. riculture and children running around growing up on the farm paints a Rockwell-esque picture. With each family member taking on specific responsibilities, the farm is complete and each area is dependent on the next. This family, the parents, the three sons, their wives and the grandchildren, are organic, natural, down to earth, and clearly have found their happy place. There is an energy and a harmony in the air. You can taste it. Okay, I am ready to start packing the bags. 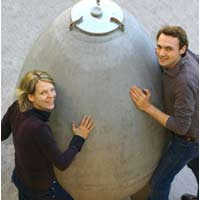 We head underground to the wine tasting room and sit among the giant concrete eggs. The tasting starts with a frizzante style pinot noir rosé. This lightly bubbly, a touch off-dry, pink wine was actually first made for Werner and Angela’s wedding. We meet Angela and find out she is the actual winemaker in the family and appropriately named as she is a winemaking angel. Her wines are lovely across the table. All show balance and character. She greets us briefly before having to run off and chase their two young daughters who are peaking at us through the glass ceiling from their house above ground. As the tasting moves forward we are treated to a selection of sausages made from the farm’s Angus beef and from their wonderful fatty Mangalitza pigs. I can’t stop eating. The center of the plate has a tub of rendered pork fat, which looks like hummus, and is spreadable like butter on bread. A little goes a long way. The Meinklang Gruner Veltliner is a stand out and absolutely atypical in style. They say other Austrian regions laugh about the thought of Gruner in this area, but the lip-smacking acidity and gulps of fruit are just right for me. I’ll take Gruner from Burgenland any day. "perfect mean" or "Phi" from Leonardo Fibonacci. Werner’s explanation details the concrete’s micro pores and as the wine ages in the egg, there are microscopic level oxygen exchanges which work the wine slower than using a wood barrel. In additional chemical chains form in the wine which get heavy and fall downward, forcing the wine to churn slowly up the sides of the egg to the top and fall back into the center, a sort of natural convection type movement. 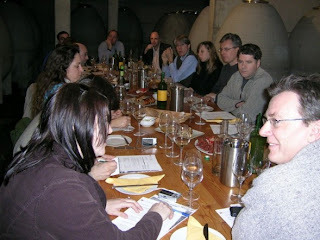 Using the eggs, they have learned that very little sulphur dioxide is needed as co mpared to their other wine making techniques. We taste the “Konkret St. Laurent,” and this is the best St. Laurent wine I have ever had, hands down. I am a believer. They started with a couple of eggs and now the winery looks like a chicken coop. The good news is that you can adopt an egg for just 3,000 Euros which gets you 2 cases of wine per year from your egg, over 10 years. That’s a deal!